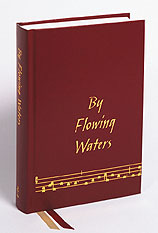 This section contains material related to Paul F. Ford’s work on By Flowing Waters: Chant for the Liturgy, the first-ever complete-in-English version of the Graduale Simplex, the second of the two official songs books of the Roman Catholic Church for use at the Eucharistic liturgy (the other book is the Graduale Romanum). By Flowing Waters: Chant for the Liturgy is a work-in-progress. This section and its subsections will soon contain downloadable MP3 files of every chant in the book (all 680!) and downloadable MPEG selections from a video presentation about the kinds of chants—and how to sing them—in By Flowing Waters. Please keep visiting this site for new enhancements! I can also send you a CD that contains a 35-minute demonstration film produced in our seminary studios. I demonstrate how to use the various kinds of chants in By Flowing Waters. If you wish a copy of this CD, send me a check for $3.00 made out to “Paul F. Ford” at my seminary address. For the very generous reprint policy of the Liturgical Press for assembly/congregation editions of chants from By Flowing Waters, see the reprint permission.